These incredible composite photographs allow us to see present-day places and structures as they were decades in the past. Some reveal historical tragedy — others simply the passage of time. 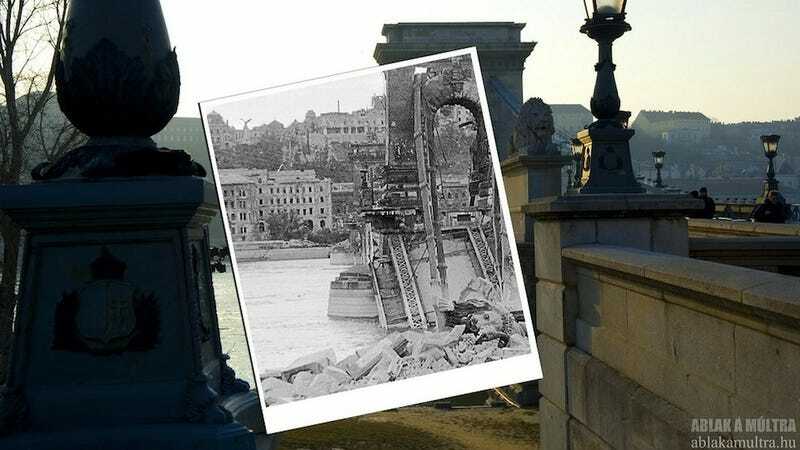 The picture above is the damaged Chain Bridge of Budapest, Hungary in 1945, and today. The composite image was made by Zoltan Kerenyi. These photos taken after the earthquake could made awesome mashups with the 21th century photos taken by Shawn Clover two years ago. What would the 1906 San Francisco Earthquake look like today? The building was built in 1919 and functioned as a high school until 2005. Since then it's abandoned and totally left to rot. Christopher loves good movies. He loves them so much that he takes a screenshot from his favourites and visit the filming locations to make the perfect composite shot.